Two days ago, Google kicked off its annual developer conference called Google I/O. The event this year is marked by the announcement of some amazing new products to be released in the next few months. These are basically Google Home: (‘a voice-activated product that brings the Google assistant to any room in your house. It lets you enjoy entertainment, manage everyday tasks, and get answers from Google—all using conversational speech’) and Allo: (‘ a new messaging app that also comes complete with the Google assistant, so you can interact with it directly in your chats, either one-on-one or with friends.’). Check out Google Blog to learn more about these new products. 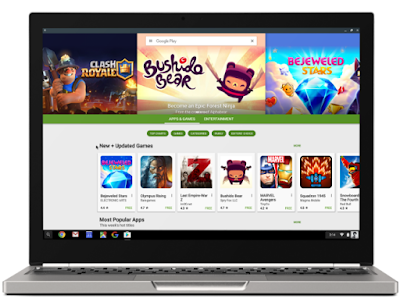 Another important announcement made by Google yesterday relates to Chromebooks. The popular app store, Google Play, is now coming to Chromebooks allowing users to access and use their favourite Android apps right in their Chromebooks. For teachers using Chromebooks in their instruction, this new integration means new learning and teaching possibilities using educational Android apps. However, as for now only some Chromebook models are supported, check out this list to learn more about these models. Google Play will be rolling out to other models in the upcoming weeks.